Here’s an interesting thought. Could the gold sell-off be related to a squeeze on collateral brought on by a series of very different bank crises in Europe, starting with the SNS Reaal nationalisation and Anglo Irish emergency assistance operation and culminating with the Cyprus crisis? It’s a theory being considered by Jeffrey Snider, chief investment strategist, at Alhambra Investment Partners. The basic point being, when you haven’t got anything to repo and funding becomes tight, gold is likely to sell-off in anticipation of further banking and asset problems. This time the effect may also have been magnified because of the changing nature of the bailout game. In effect, then, the Anglo Irish experience would set the table for Cyprus. In close proximity to SNS, I think bondholders (and perhaps some depositors, as evidenced by the movement of deposits out of Cyprus in the weeks before March 15) began to see the writing on the wall. These nominal amounts are tiny in comparison to banking markets and funding regimes all over Europe, but it isn’t the size that is worrisome it is the growing use of the same “template” – the entire character of bank bailouts appears to have changed. European governments were talking about “bail-ins” and haircuts in Spain the year before, but are now practicing them in Holland, Ireland and Cyprus. 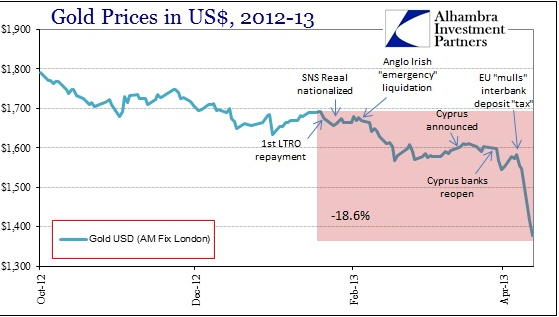 In the context of bank liquidity, gold prices hit a high just before the first LTRO repayment in January, and then sold off hard after Anglo Irish.There was a period of calm before Cyprus, but again another selloff the day Cypriot banks reopened from their government imposed “holiday”. What’s also notable, says Snider, is that the heaviest selling began on April 11, the day after it was reported by Reuters that European finance ministers were considering a proposal to extend depositor haircuts to interbank deposits. Similar ideas had beenfloating around the bail-in directive for a while, of course. If this overall interpretation of angst in European funding markets is correct, then the cumulative effect of everything from SNS to Anglo Irish to Cyprus to the EU memo is potentially a large shuffling of funding, particularly for banks that are perceived to be the weakest. Not wishing to be a liability holder in the crosshairs of bail-ins and deposit haircuts, counterparties to these weak institutions may have removed themselves in full or in part (to get below the €100,000 insured limitation for individuals). In turn, that may have forced these firms to find funding substitutions at short notice, eventually appealing to whatever collateral relationships they could find including gold-based. I have little doubt that this kind of pressure on gold was cascaded into other selling pressures, including running preset stops. However, I do think the impetus for selling, particularly in the wake of continued and unprecedented central bank debasement activities, is a window into interbank liquidity problems. If we add in the collateral actions of various QE’s, the pieces connect here all too well for this to be ignored. If the Snider is right, the significance of that one announcement may have been under appreciated by anyone other than institutional Treasury departments until then. It’s also worth reminding that the US 10-year Treasury experienced extreme specialness around this time as well. So much so, that the Federal Reserve evenissued a request for information on who was holding large positions in the 2023 US Treasury note. Scott Ed Skyrm, a former repo at Newedge, offers some interesting insight into the episode on his repo-themed blog this week. The 10 year note had recorded impressively low Repo rates during the week before the reopening, with overnight rates trading as low as -3.75%, -3.35%, -3.40%, and -3.25%. With the Fail Charge set at -3.00% and the 10 year note trading below the Fail Charge, it prompting some market participants to question why someone would pay an extra 75 basis points to book a trade which might not even settle when they could just have an uncovered fail and accept the charge of 300 basis points. The answer is that sometimes there are other costs associated with fails which are not completely economic. There are increased operational costs, regulatory net capital charges, timing differences in booking the interest revenue versus interest expense, and potentially most of all, the cost of having to explain to your boss why you’re not covering all the firm’s short positions. On March 15 all the fails cleared up and the 10 year note ended the day trading close to general collateral. Since March 15, the 10 year note has remained the strongest performing “special” on the curve, with a drop in Repo rates over quarter-end and another drop before the second reopening. Since more supply was added to the market in the second reopening, it is very unlikely that a triple 10 year note issue will ever trade special again. The shortage of collateral may have been temporarily overcome by more issuance, but we can’t help wondering if there’s been some sort of follow-through effect regardless. After all, if deeply negative repo rates and a shortage of collateral generally has a supporting effect on gold — because it makes zero-yielding gold look like a good option in comparison — any collateral expansion (such as the one responding to the 10-year note squeeze) could inadvertently increase the incentive to drop gold and switch into Treasuries. From the point of view of a funder, meanwhile, lending money against gold collateral is much more appealing than lending against Treasuries at a special rate. That is until the special rate suddenly goes away. Something that might leave those funding themselves via gold, with no choice but to liquidate holdings. To what extent such a repo effect is really responsible for the gold move — rather than just an elaborate and grandiose theory — depends entirely on the degree to which gold holdings have been collateralised for funding purposes in the last few years. On that front, we’ve not seen any compelling data yet.